For the Tip Card, see Field Spell Cards (Tip Card). Field Spell Cards, formerly Field Magic Cards (Japanese: フィールド魔（ま）法（ほう）カード Fīrudo Mahō Kādo), have the advantage of being able to change the entire state of play for its controller's or for both players' side of the field. Field Spell Cards are placed on the Field Zone, which is separate from the Spell & Trap Zones. The activation of a Field Spell Card is Spell Speed 1. A player can activate or Set Field Spell Cards in an open game state during their Main Phase. Field Spell Cards must be placed in the Field Zones. Each player may only control 1 Field Spell Card. Even if a player already controls a Field Spell Card, they are still able to activate or Set another one, in which case the previous Field Spell Card is sent to the Graveyard via game mechanics. Prior to March 21, 2014 (for the OCG) and July 14, 2014 (for the TCG), only one single Field Spell Card could be face-up on the field at a time. If either player activated another Field Spell Card, the previous Field Spell Card would be destroyed via game mechanics. Field Spell Cards need to remain on the field for their activation and their activated effects to resolve properly. If a Field Spell Card leaves the field before the card itself or its activated effect resolves, that activation will resolve without effect. Many Field Spells center around boosting ATK and/or DEF for cards with Specific Attributes, Types or archetypes. However, many Field Spells have other effects, such as recycling cards (e.g. "Madolche Chateau", "The Grand Spellbook Tower"), weakening the opponent's monsters (e.g. "Shien's Castle of Mist"), searching monsters and/or swarming the field (e.g. "Naturia Forest", "Shrine of Mist Valley", "Scrap Factory") or even preventing the field from being swarmed (e.g. "Summon Breaker"). Most Field Spells affect both players, but some only affect their controller's side of the field (e.g. 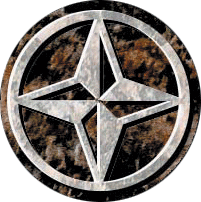 "The Seal of Orichalcos", "Mount Sylvania", "Closed Forest"). In the Yu-Gi-Oh! ARC-V anime, Action Field Spell Cards are introduced, where these Field Spell Cards are not real cards but are created with the "Solid Vision with Mass" effect as soon as the Dueling Field is created. However, two Field Spell Cards can be activated as long as the other Field Spell Card is an Action Field Card, seen when Sergey used the Field Spell "Earthbound Tundra" when the Action Field Spell Card "Crossover Acceleration" is activated, during his Duel with Jack Atlas. In the Yu-Gi-Oh! Tag Force video games, Field Spell Cards can produce an animation on the playing field, such as a soaring bird for "Rising Air Current". 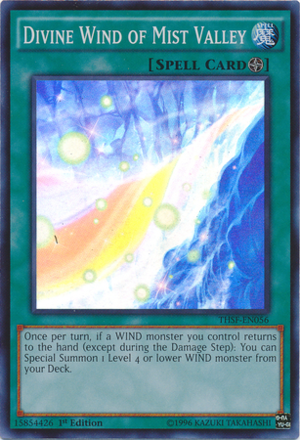 "Divine Wind of Mist Valley"
"The Seal of Orichalcos" is the only Field Spell Card that can be activated only once per Duel. "Dragon Ravine" was the first Field Spell Card to have been Forbidden. The "Ghostrick" and "Triamid" archetypes are currently tied for the most Field Spell Cards of any Archetype, with 3 each ("Mansion", "Museum" and "Parade" for "Ghostrick" and "Cruiser", "Fortress", and "Kingolem" for "Triamid"). These Field Spell Cards are also the only Spell Cards that support these archetypes. "The Sanctuary in the Sky" is mentioned in many card lores of "The Agent" monsters, but its effect does not support this archetype explicitly or directly. ↑ "Rule Changes as of July 14, 2014". Yu-Gi-Oh! TRADING CARD GAME. July 2, 2014. Retrieved July 24, 2018. This page was last edited on 27 December 2018, at 23:11.